The Monmouth County Fraternal Order of Police, Superior Officers Lodge #30 is proud to announce our 8th Annual Winter Gala and Award Recognition Banquet. 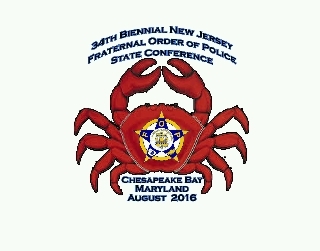 New Jersey State Fraternal Order of Police Vice President James Stewart. 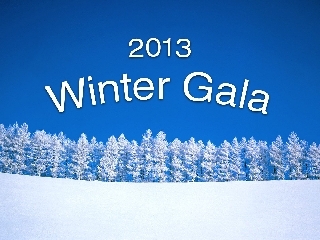 This year's gala will be held at Doolan's restaurant in Spring Lake on December 12th 2015. Act early and reserve your tickets today before we sell out as we have done so quickly in previous years. Sponsorship opportunities are also still available. We look forward to seeing all of you, our friends, family and supporters!!! 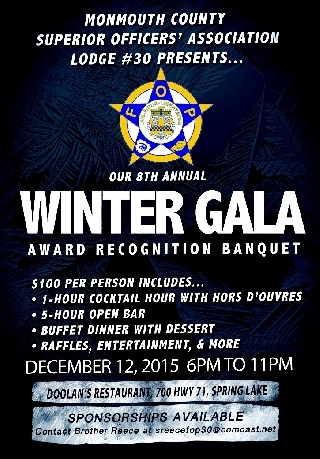 The Monmouth County Fraternal Order of Police Superior Officers Lodge #30 is proud to announce its Sixth Annual Winter Gala and Award Recognition Banquet. 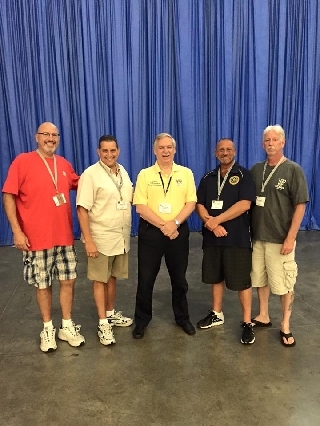 This year Lodge 30 will bestow its two most prestigious awards to Monmouth County Sheriff Shaun Golden and New Jersey State Fraternal Order of Police National Director of Membership Sevices Steve Szypulski. This year's Gala will be held at Doolans Restaurant in Spring Lake, New Jersey on Saturday December 7, 2013 The festivities will befrom 6:00PM to 11:00PM and will consist of a one hour cocktail hour with hors d'oeuvres, a beautiful buffet dinner, dessert, a five hour open bar and entertainment. Attached you will find your dinner and ad-book reservation forms. Act early, come out, and join the Monmouth County FOP in honoring two of New Jersey's most deserving professionals. 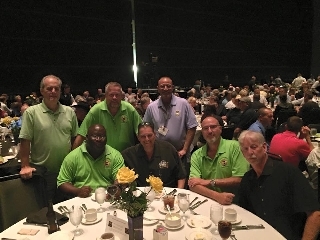 The Fraternal Order Of Police makes no warranties or guaranties regarding the information contained on this website and bears no liability for the user's failure to obtain competent legal advice. 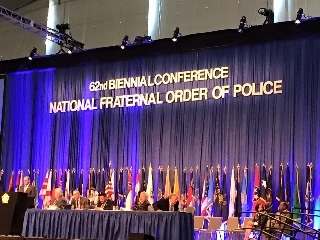 Neither the Fraternal Order Of Police nor the individual authors whose work has been published here are responsible for, nor assume any legal liability, any errors or omissions, or results obtained from the use of the information, and shall have no liability for any damages, of any type whatsoever, occasioned by the actions or omission of actions, taken in reliance upon any information contained in this site.